I am using cheap and sensitive cam QHY5L-II-M for occultation observations and I want use it also for video meteor observations. After test of more than 20 lenses I found usable one (Tamron M13VG308) which is still manufacturing, have real 1.3 MP resolution and f ration 1:1. You can see first light test of this configuration in attachment. Diagonal field dimension is approximately 120 deg. and real objective diameter is 3mm. From attached 4 different videos one pair has been recorded with 15 fps. / 0.04s exp. another pair with 25 fps. / 0.066s exp. The videos commented as "full future" has been made with Gain Boost function, which requires bias substraction. Now It is available only in original software EZPlanetary, but manufacturer working on implementation it into the WDM driver. Naked eye star limit magnitudes from videos are 4 mag for Actual WDM 25fps, 5mag for Actual WDM 15fps & Full future 25fps and 6 mag for Full future 15fps approximately. I try use your UFO Capture HD2 (trial) for meteor detection but I have 2 problems. WDM driver use as primary colorspace RGB8. If I understand your messages correctly, latest UFO versions support it. But when I start Preview (or Detect) UFO give me this error message "UE009:Cannot Render U-> Writer stream". WDM driver setting are dedicated into 2 menus. First of them with items for exposure time, gain and usb speed is available from UFO. But second one with ability to set colorspace (except RGB8 are supported also Y800 and YUY2) resolution and binning is unaccesable from UFO. Can you please help me. Thank you very much. Cam full future video with 0.04s exp. Cam full future video with 0.066s exp. Actual WDM driver output with 0.04s. Actual WDM driver output with 0.066s. Thank you very much for interesting information. It sounds very attractive camera and lens. Actual test report is precious and will help many people a lot. Sorry, I guess it is the incompatibility on the video capture interface, and it may be it is difficult to use UFOCapture on it. There are so many variation on video capture interface on Windows. For example BlackMagic supports both native DirectShow video capture and WDM video capture on Windows. UFOCapture work well with its DirectShow video capture interface (such as DeckLink video capture), but won't work with its WDM driver. I would like to test QHY5L-II-M, if I can have it. But I am quite busy this year , so please don't expect much. This looks very interesting. I've been looking for a camera to try and improve on the resolution I get for spectroscopy. Did you need to modify the lens in any way or use an adapter for the c thread? Maybe we can discuss it at the next IMC? I found partially solution for my first problem (how to use QHY5L-II-M with UFO Capture HD2.) I am using directshow filter ffdshow tryouts for converting RGB8 colorspace (on output from QHY WDM Driver) to YV12, which is acceptable in UFO software. But it has some disadvantages. Firstly ffdshow don`t support any monochrome output, so saved videos are 2 times bigger than normally, therefore contain also unreal color information. Second problem is that screen is over flipped. When I use compensation function for this implemented in ffdshow, all looks fine in preview, but saved files are still flipped. If I good remember UFO Analyzer have option to compensate similar effects when measuring data, but it is still little bit uncomfortable. I have 1 more problem with UFO Capture HD2. When program detect a meteor, it will not continue with detection. I tested it on 2 computers. On first, detection is reactivated after long time (more than a minute). On second PC, it will not self activated anymore. (I must do it manually.) CPU consumption drop down rapidly, so there can`t be a problem with computing power. Videos are in 1280x960 resolution, and FPS is 15. Also problem with HDD speed can`t explain this situation. Is this restriction in free (not registered) version, or other problem? Thank You. Also Jakub Koukal from CEMeNt network going to yous this cam and lens for observation meteor spectra. I will write here soon about first results from my test observations with this equipment, so I can report also about his first measurements. And yes, we can talk also on next IMC. I want to prepare some short talk about this. Have a clear sky to all. Sorry Bill, I almost forgot. Used lens has CS thread, so I buy right reduction from manufacturer. It cost 20 Eur. In package was also 2 very thin spacer rings. But it seems 2 more will be necessary to precise focus in widest lens mode (shortest focal length). Also all test videos has been recorded with approximately 90% of full filed of view. I decided to buy one of these cameras to experiment with. I have installed UFO HD and it seems to work OK with me now but only at 10 frames/sec. I installed the latest driver from QHY and the various ascom platform and ascom drivers. It seems to be very important to fully activate the .NET setting in windows. I checked both boxes with this and it seems to work OK if a bit slow frame wise. Have you tried adjusting the USB setting and checking the "high speed" box under the "SET" button in UFO HD. I'm not presenting a talk this year but I have a poster to show about the spectroscopy from the last year and my most recent results. I look forward to hearing your talk. Since the IMC will be after the Perseids maybe we'll have some good results from our tests. This shows the results I've got from the qhy5ii plus 12mm f1.2 lens last night. UFO HD is pretty cool! I've just seen the final programme for the IMC. I'm looking forward to your presentation. I did catch 5 meteors with my QHY set up but they were quite disappointing when compared to the WATEC cameras. 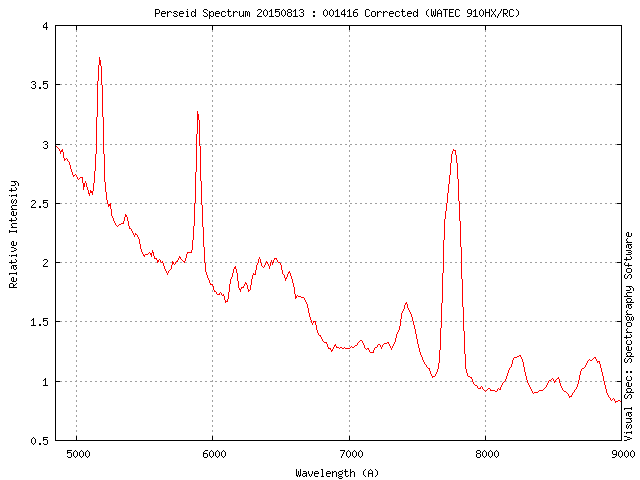 I also caught a spectrum on both the QHY and one of the WATECs allowing a direct comparison. 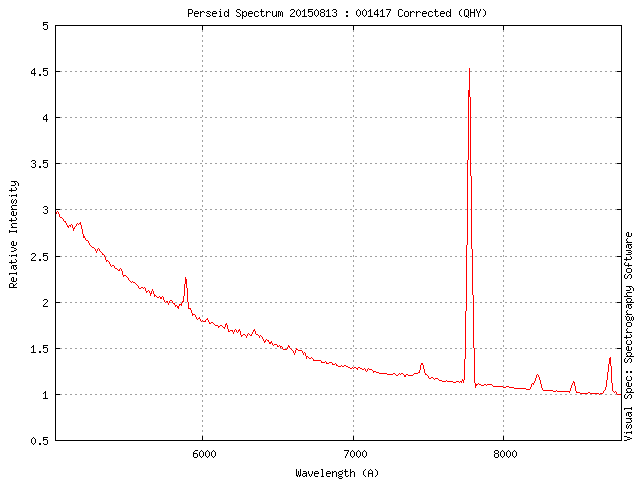 I've attached two graphs of the spectra. The higher resolution of the QHY is nicely seen as "sharper" lines. The QHY had a 12mm f1.2 lens and the WATEC had a 12mm f0.8 so there is some photometric penalty as well as smaller pixels on the QHY giving a reduction in effective sensitivity. I was surprised the 777nm Oxygen line was so strong with the QHY compared to the other near IR lines. Both spectrum were processd in exactly the same way. Anyway an interesting test and I think it has some possibilities due to it's better detector resolution and better dynamic range.